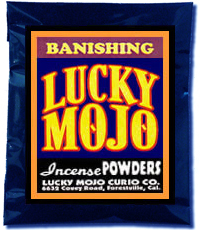 Banishing Incense is used to smoke a house, shed, barn, or place of business where unwanted entities or people -- spiritual vermin, so to speak -- have lade a mess or brought low and dark energies in their wake. First you clean the place, and then you banish them forever, to the outer darkness, from which they can never return. Light the incense with all the windows and doors shut, and when you get a good bit of the fumes going, fling open every door and window and let the smoke disperse. As soon as the ai is clean, close the wndows and doors, and seal them with Protection Oil.